Beirut joined over a dozen cities worldwide as the first Middle East capital to host the Global Classrooms program, teaching school students on the principles of dialogue and negotiations, sustainable development, human rights and international peace and security. 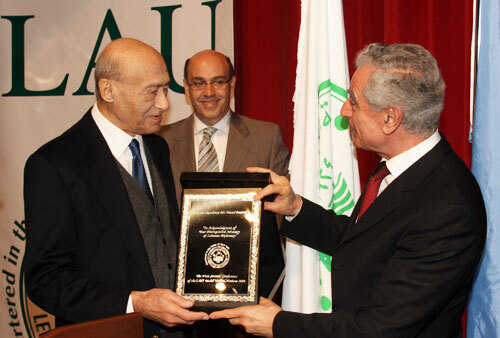 Mr. Fouad Boutros receives "Diplomatic Creativity" award from Dr. Joseph Jabbra as Mr. Elie Samia looks on. Click any image to view all three pictures. The event drew over 600 students from 82 public and private high schools across Lebanon. 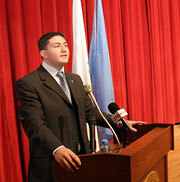 The opening at UNESCO Palace April 8, in the presence of government officials, diplomats, school principals, teachers and parents, marked the first LAU Model UN conference. The annual event puts into effect a five-year partnership agreement between LAU and the United Nations Association of the United States. “It is the resolve to understand, accept, help and share with others that will spare humanity many a tragedy,” wrote LAU President Joseph G. Jabbra on his introduction to the event. “Your experience at this Global Classrooms conference will allow you to learn and develop as global citizens,” said UNA–USA President William Luers addressing the young participants. “In today’s interdependent world, young people of all backgrounds must be able to understand the global economy and world issues, appreciate different cultures and perspectives, and possess skills for effective research, analysis and problem solving,” said Eddy Bayerdelle, President of Merrill Lynch International, the program’s global sponsor. LAU Model UN Secretary-General Anthony Torbay, an International Affairs student who participated in the Harvard World Model UN, urged students to become aware of global issues as a first step towards the higher goal of resolving conflicts through cooperation and understanding. The event was held under the patronage of Culture Minister Tarek Mitri. “Diplomatic Creativity” awards were granted to MP Ghassan Tueini (represented by An-Nahar newspaper’s Rajeh Khoury), former minister Fouad Boutros, former ambassador Nadim Dimashkieh and the late Charles Malek (represented by his institution’s vice president, George Sabra) to recognize their international diplomatic efforts in service of their country. With the event officially open, students carried out conference proceedings at the Beirut campus until the following day. 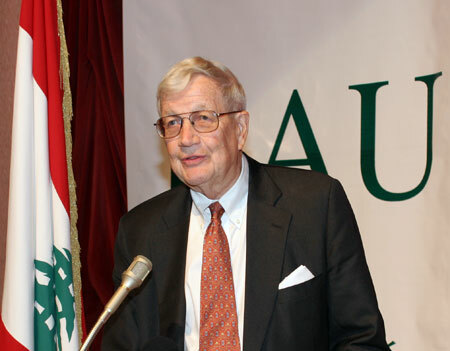 In the run-up to the event, preparatory sessions had been held over seven Saturdays on LAU campuses, covering topics in negotiation, diplomacy, UN procedures, resolution writing as well as research and analysis techniques. During training sessions, students were divided in country groups, each asked to research two topics out of which they picked one for debate during the simulation. Resolutions were submitted to a secretariat of LAU students. Byblos Guidance Director Elie Samia coordinated the project. The two-day event culminated with the distribution of diplomacy awards to participating schools during a closing ceremony at the UNESCO Palace in Beirut.